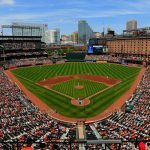 The BTU is headed to the Camden Yards on Friday, September 14th for the Orioles vs. Chicago White Sox game! Game time is 7:05pm. Tickets are $8.00 per person ages 3 and up. You must be a current BTU member to purchase tickets. $8.00 tickets for family and friends purchased by a current BTU Union member—membership will be verified. $2 of the price of a ticket will benefit the Community Services Projects, including the Food Pantry and other services provided to members in crisis. A limited number of tickets are on sale while supplies last. On sale ONLY at the BTU office between 9:00 a.m. and 4:30 p.m. No reservation of tickets. No ticket sales over the telephone. ****Make your check or money order payable to the Baltimore Teachers Union. Return check fee – $50. Cash, Discover, Master, and Visa Cards are accepted with separate picture identification. Important Notice: BTU is not responsible for lost or stolen tickets. No exchange or refund of tickets.